Welcome to this new SiSAL column, which will examine a long-term project conducted at one institution in depth over several issues. 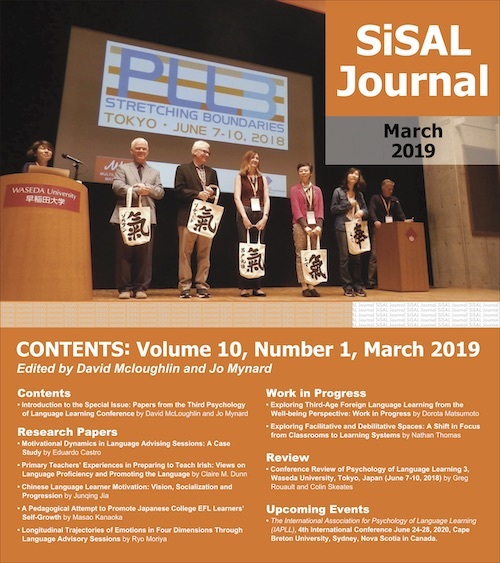 The focus of this column will be the curriculum design project currently being undertaken at the Self-Access Learning Centre (SALC) at Kanda University of International Studies (KUIS) in Chiba, Japan. In my role as Academic Coordinator of the SALC from 2011-2013, I was in charge of leading this project in its initial stages, before I moved institution. As editor, it is from this perspective, as someone familiar but no longer directly involved in the project, that I hope to collate and introduce a number of columns from the learning advisors and teachers who are conducting the research and designing the new self-directed learning curriculum. In this first installment, a revision of an earlier article which first appeared in the IATEFL Learner Autonomy SIG newsletter, Independence, (Thornton, 2012) I present the background to the project, the framework used to guide it and the results of the first stage, the environment analysis. Since 2003, the Self Access Learning Centre (SALC) at Kanda University of International Studies (KUIS) has offered elective, non-classroom based self-directed learning modules for first and second year students which are taught through the SALC by a team of Learning Advisors. The modules aim to help students develop their self-directed learning skills through learning about and implementing a variety of cognitive and metacognitive strategies. 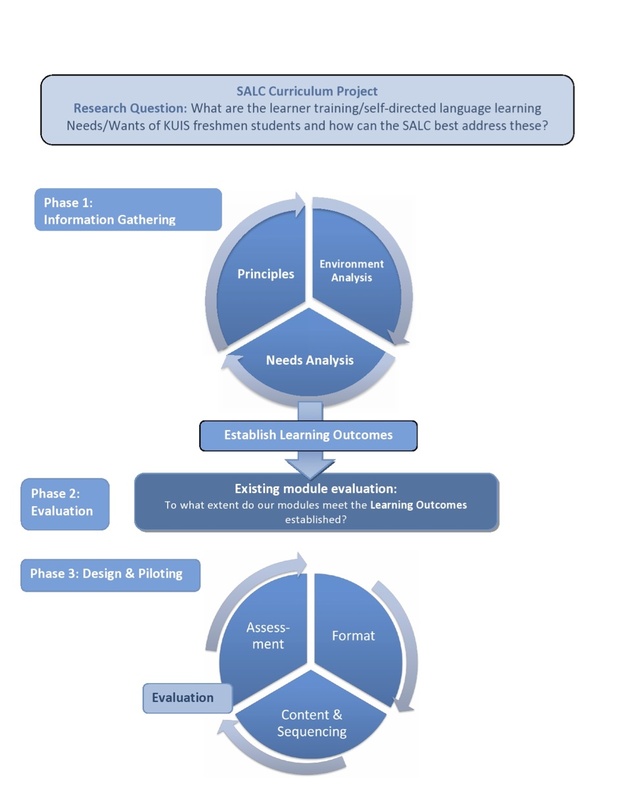 This article describes the evaluation and modification process of this SALC curriculum currently being undertaken by the Learning Advisory team, and introduces an adaptation of a curriculum design model originally intended for language curriculum design (Nation & Macalister, 2010a). The first step of the process, the environment analysis, and its findings will also be discussed. The SALC currently offers two elective non-classroom-based modules to freshman students: the First Steps Module and the Learning How to Learn Module. These modules are offered in addition to students’ compulsory language classes, and are completed in their free time, with regular written feedback and occasional face-to-face contact with learning advisors through advising sessions or small group workshops. One module is offered per semester, and each module lasts for eight weeks. While offered on a voluntary basis, in recognition of their efforts students can gain extra credit for their freshmen class if they complete a module. In 2011-12, around 30% of freshmen opted to take the first module, with 30% of these students also taking the subsequent module. The first module, “The First Steps Module”, follows an activity and reflection model, in which students first complete several short activities on a topic related to self-directed learning skills, such as goal-setting, time management or learning strategies, and then write a brief reflection on their work, to which a learning advisor responds, initiating a written learning dialogue. The module concludes with the student composing a learning plan to achieve a specific learning goal, using the concepts introduced in the preceding units. In the second module, “The Learning how to Learn Module”, students review and then use this learning plan as a basis for their own self-directed learning, writing reflections and keeping documentation of their work. The student is supported by the learning advisor through several face-to-face advising sessions and the weekly written dialogue, through which the students are encouraged to analyse the effectiveness of their activities and make appropriate changes to better address their goals. For more details on these modules please see Noguchi and McCarthy (2010) and the columns appearing in the IATEFL Learning Autonomy SIG newsletter, Independence, by Liz Lammons (2011, 2012). The evaluation of the SALC curriculum is part of a wider curriculum project initiated by the English Language Institute (ELI) at Kanda University of International Studies, in which each department is reviewing its content and objectives, in order to deliver a programme which is relevant for current students. Part of this project is a re-evaluation of the principles on which the ELI should be based. As the ELI evolves to reflect recent technological innovations, such as mobile learning, and pedagogical thinking, and the advent of critical literacies, the SALC has a duty to ensure that the content and formats in which this content is delivered reflect best practice in the field, and correspond to the needs of the study body. 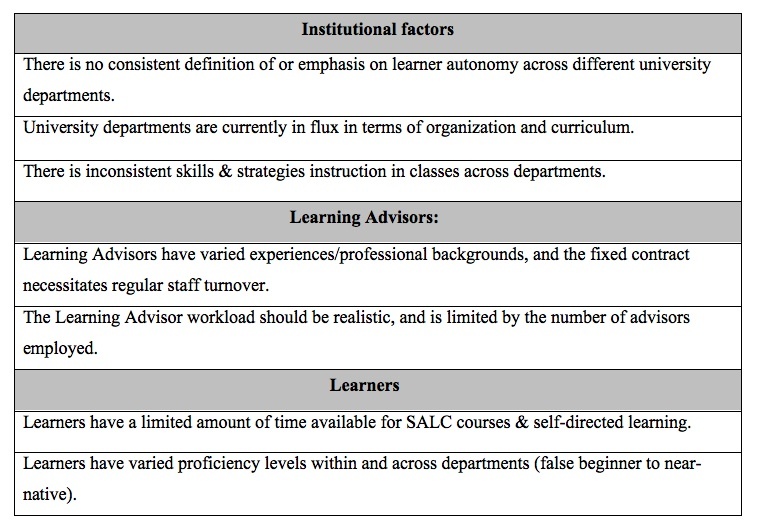 Since the inception of the modules in 2004, the advising team has grown from three to ten full-time advisors, and several classroom-based courses have also been offered to different departments based on SALC module content, significantly changing the context in which the modules are run. The current programme has been running in its present format for about nine years. During this time student feedback surveys have been conducted at the end of each semester and learning advisors have regularly reviewed the module content, removing or replacing activities, changing the wording of instructions or reflection prompts and making other surface-level changes. In this way existing adaptations to the modules have been made based on the motivation and innovations of individual advisors, with minimal student input, rather than as part of a systematic review of the entire curriculum (see Thornton, 2010; Yamaguchi et al., 2012, for details of some of these innovations). This rather ad hoc approach is labeled curriculum enhancement by Koga and Hall (2004), and is contrasted with a more systematic process, which they term curriculum modification. While individual instances of curriculum enhancement can improve current courses, and is often the most realistic form of curriculum development for busy professionals, a methodical curriculum modification programme, which involves taking the time to conduct a thorough needs analysis of the student body and establish clear principles and learning outcomes, can ensure that the creativity and knowledge of advisors can be utilized in a more systematic way, to offer maximum benefit for learners. What are the self-directed language learning needs and wants of KUIS freshmen students and how can the SALC best address these? While this installment of the column will discuss the first step, environment analysis, subsequent installments of this column will document the further steps in this process. Figure 1 outlines the three steps in this phase: environment analysis, needs analysis and principles. Through investigating our academic environment, the needs of our learners and the principles on which we base our content, we can develop a clear understanding of these aspects of our context and establish learning outcomes on which to evaluate the current curriculum. The environment analysis, also termed situation analysis (Richards, 2001) aims to identify factors which will influence the curriculum design process and establish clear parameters (for more details of this step, and our results, please see below). The needs analysis, first made popular by Munby (1978) in the field of English for Academic Purposes, is now considered a vital step in any curriculum design programme. In our case, rather than examining language needs, we have focused on the self-directed learning needs, namely the cognitive, metacognitive and socio-affective skills and strategies necessary to be a successful autonomous language learner. This step has involved consulting various stakeholders and the literature on self-directed learning and learner autonomy, in order to gain a full picture of what kind of skills our students need and which of these the SALC should be trying to promote. The needs analysis will be the subject of the second column in this series. The principles step addresses the pedagogical and methodological theories which form the foundation of our understanding of self-directed learning and underpin our SALC. Nation and Macalister (2010a) warn against adopting one fixed methodology, which will always be open to criticism and may be in danger of being undermined. They suggest instead that individual principles, grounded in reputable research, can form the basis of curricular principles. If one principle is subsequently questioned or disproved, removing or adapting it does not necessarily endanger the integrity of the whole system (Nation & Macalister, 2010a). After developing a comprehensive set of learning outcomes for our curriculum, we can then apply these to our current modules to establish the degree to which they meet these outcomes. This evaluation is designed to highlight any gaps in our current content and reveal areas which may need modification or further development. This step involves examining existing materials in detail, and gathering data from students about their experiences taking the modules. Once we have established what changes we need to make to the content and format of the courses, we can design and pilot new or adapted materials and assessment procedures. This phase also requires us to consider what kind of regular evaluation procedures we can build into the curriculum in order to establish the degree to which it is meeting the learning outcomes. By building this kind of evaluation into the curriculum at the point of design, rather than retrospectively, we will be able to identify aspects which may require change or further development on a regular basis, and keep our curriculum relevant. While subsequent columns in this series will describe each step in turn, detailing both our methodology and our findings, this first column concludes by outlining the process of our environment analysis. The environment analysis involves establishing the affordances and constraints in a particular context. Although this is especially important if curriculum developers are externally contracted, it is equally necessary for internal members of staff such as the SALC team to have a clear understanding of issues such as facilities, characteristics of the student body and the size and skills of staff, in order to develop a curriculum which is both appropriate and sustainable for the institution. What strengths and constraints does the environment of the English Language Institute offer? What are the qualities of freshmen students? What are the qualities of learning advisors? As KUIS has six different departments, each with its own learner demographics, it was necessary to investigate each separate department. Advisors used the following sources to answer the environment analysis questions: their own knowledge of the context at KUIS, analysis of departmental documents giving course objectives and curriculum plans, and interviews with departmental directors and coordinators. This resulted in a large amount of data, which can be referred to at subsequent steps in the process. In order to identify the most relevant data for our project, each project team member organized and presented their findings, highlighting the areas considered most relevant. This data was then discussed and prioritized through several advisor meetings, resulting in a list of seven important constraints identified and agreed upon by the whole team, which can be found in Table 1. These include aspects from all three categories mentioned above. The most prominent institutional factor was the recognition that no consistent definition of learner autonomy exists across the various departments that that SALC works with and that different departments may place a different emphasis on it in their own programme objectives. In terms of the learning advisors, the differing professional backgrounds and previous experiences of advisors was the main factor identified for this group. When considering our learners, we were easily able to identify the very limited time our students have for self-directed learning as a major consideration for our curriculum. In the KUIS environment, students often have over 20 hours of classes per week and many assignments to complete, in addition to part-time jobs and club activities, which often take up a significant amount of their time and energy. With each constraint we then had to consider two issues: could it be overcome, and if so, how? If not, what are the implications of this constraint for our curriculum? For example, in terms of learner factors, we have no control over the heavy workload given to students by the university system, so we have to work within this constraint. We have therefore concluded that we may need to reduce the content we provide in our modules. On the other hand, is has also been possible to overcome some constraints. Identifying that there was no consistent definition of learner autonomy across the different university departments, has given us the initiative to invite discussion on this topic with senior management, resulting in a new document specifying the philosophical and pedagogical principles of the English Language Institute and the role of autonomy in those principles. In this way, it was therefore possible to overcome the constraint we had identified to a certain degree. Having completed this step thoroughly, we hope to ensure that any resulting curriculum modifications are successful and sustainable in our context. As the overall institutional project is also ongoing, it has been necessary to revisit and revise the findings of the environment analysis during the course of the project. This has generally been done once a semester. It is in taking the time to identify and carefully consider the implications of each constraint that the environment analysis becomes truly useful, as we have been able to gain a greater awareness of the important factors to consider as we design the curriculum. While this project may seem to be very large in scope, the SALC team believes that taking the time to conduct a thorough curriculum modification through conducting a systematic evaluation before making any changes is the most sensible way forward. Such a thorough evaluation will result in a more sustainable and relevant programme which: 1) takes into account the constraints of our context, 2) is based on a comprehensive understanding of the needs of our student body, and 3) is in accordance with the recognized principles and best practices of our field. The next column in this series will address the needs analysis. Katherine Thornton is a learning advisor and the Program Director of E-CO (English Café at Otemon), a self-access centre at Otemon Gakuin University. She has worked as a learning advisor for five years after gaining a MA in TESOL from the University of Leeds, UK, most recently at Kanda University of International Studies. She is also the current president of the Japan Association of Self-Access Learning (JASAL). At various stages, the following people have been key members of the project described in this first case study: Junko Baierschmidt, Neil Curry, Yuki Hasegawa, Elizabeth Lammons, Tanya McCarthy, Brian R. Morrison, Jo Mynard, Diego Navarro, Akiyuki Sakai, Keiko Takahashi, Katherine Thornton, Satoko Watkins, and Atsumi Yamaguchi. Nation, I.S.P., & Macalister, J. (2010a). Language curriculum design. London, UK: Routledge. Nation, I.S.P., & Macalister, J. (2010b). Case studies in language curriculum design: Concepts and approaches in action around the world. London, UK: Routledge. Richards, J. (2001). Curriculum development in language teaching. Cambridge, UK: Cambridge University Press. Yamaguchi, A., Hasegawa, Y., Kato, S., Lammons, E., McCarthy, T., Morrison, B. R., Mynard, J., Navarro, D., Takahashi, K., & Thornton, K. (2012). Creative tools that facilitate the advising process. In C. Ludwig & J. Mynard (Eds.) Autonomy in language learning: Advising in action (pp. 137-153). Canterbury, UK: IATEFL.